If you haven’t caught up to the big, little indie from the mind and pen of Kenneth Lonergan, please do get hold of Manchester by the Sea some way, somehow. My dear wife Karen and I sat transfixed in front of the flat screen after I brought home a Blu-Ray from my job at the Liverpool Public Library. Yes, Casey Affleck’s work as down-but-not-ever-out New Englander Lee lives up to the hype, and that Oscar he took home for Best Actor. Lonergan, too, deserved his Oscar for Best Original Screenplay. And this drama is worthy of its half-dozen nominations, including Best Supporting Actor and Actress for Lucas Hedges as Patrick Chandler, Lee’s 16-year-old nephew, and Michelle Williams as Randi, his ex-wife. Lonergan was nominated for best director, too. Indeed. His story takes us to the life of a hard-working, quiet janitor caring for a couple of buildings and many eccentric tenants in a nondescript Boston neighborhood. Lee goes about his work the best he can until he gets a call that makes him rush back home to Manchester. Lonergan uses flashbacks to catch us back up with the increasingly sad pieces of the life that made Lee this way. Quiet. Full of rage, and doubt, and insecurities. And now put in charge of Patrick, a confident teen who wants to mourn his dad, yes, keep the family fishing boat and his own place in the school hockey squad and his two girlfriends. Move to Boston? No way. Lee, though, has heavyweight baggage that made him flee his hometown, and it comes back in a rush every time he sees Randi, who has since remarried and tried to go on with things. Throw in Patrick’s suddenly reappeared mother, who fled her life with dad Joe and his bad heart and discovered a new and holy beau – a taciturn and right-on cameo by Matthew Broderick – and a town full of well-meaning neighbors who know all the secrets, and it’s a 2-hour, 17-minute journey through the emotional spectrum. The tale is realistic. The people are oh-so-human. Keep the Kleenex handy. But also be ready for a chuckle or two for the by-play between all these characters. The ending leaves lots of loose ends. Just like all of these folks in Manchester, you can’t have everything. 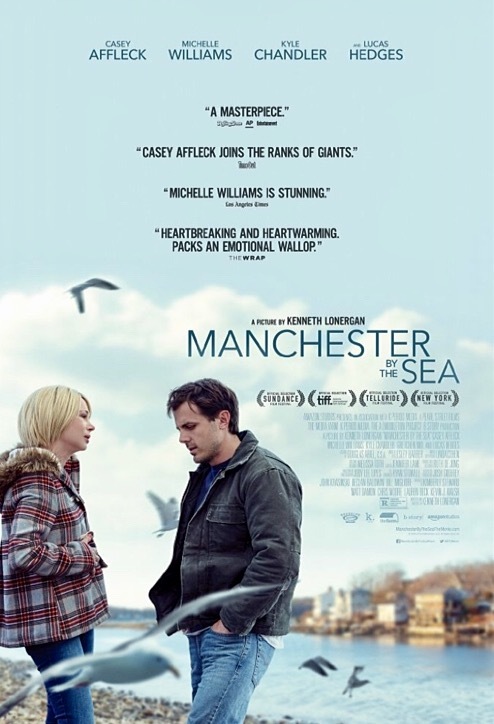 If you’ve seen ‘Manchester by the Sea,’ what did you think? The cinematography looks great in the trailers. I keep wanting to see it, but two days ago on an SNL repeat, Casey kept reiterating how sad and depressing it was. Should I take my nearly 14 yr old or just the hubs to see it? I always enjoy your movie reviews, Mark. Thank you. Must see, with tissues, check! I hope you appreciate it, Joey, and thank you for your kind words. You can do it, Beth. It is uplifting in its own emotional way, if you know what I mean. It’s some pretty tragic stuff. Nice review. Thanks, Dan. It sure is tragic.